First things first – install the eSATA PCI-express card (included) in a mini-PCI slot of your Mac Pro (or your hack). Then go over to Silicon Image, and get the 3132 Snow Leopard drivers — download the “non-RAID” version (link here). Alternatively, you can get them from MacGurus, like I did (link). Look under the “IOPCIMatch” entry, and change “0x31321095” to “0x35311095” – be careful not to include the quotes. Now press Ctrl-X, and save the file, i.e. answer “Yes”. Repair privileges with Disk Utility, attach the enclosure and reboot. You’ll be happy to see all disks on the desktop (fully hot-swapable, too!). I believe the best setup for the enclosure is to select the “non-RAID” option for the dip switches in the back (i.e. put them all in the High/Up position), and then manage individual drives within MacOS. Keep in mind that the PCI-express controller that’s included is NOT a hardware RAID one, and the switches are meaningless on a Mac. Myself, I find the SoftRAID software very useful, albeit kind of expensive. That’s another story, however. 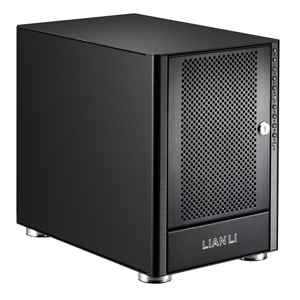 I am interested too in the 3 bay Lian Li on a Mac, but one big question remains: does it work on the mac with its own RAID? I am asking because, say your mac goes (stolen, broken etc) can you then see the disk inside if they are RAIDed from the mac? I would guess not, and then how do you recover the stuff to your new machine? I would assume instead that if they are RAIDed in the box (as JBOX, for instance), they would be seen as one block also on another machine: right, or am I deluding myself? And if teh DIPs don’t work on Mac, how is it possible to configure the card to RAID the disks? Mauricio, once OSX picks up individual disks (that’s what JBOD stands for), you can use Disk Utility to setup a RAID volume. Alternatively, you can use SoftRAID, like I did.